How have you all been since the last interview? Hope you enjoyed our interview of Josh Saltzman from Nomad’s. Today, in order to further our understanding of the world of gem cutting, we have decided to go through its history with our pal, the infamous gem dandy and gem philosopher: Justin K Prim. Here is the Gem Dandy, Justin K Prim, faceting a stone. AsiaLounges: Hi Justin, thanks for being with us today! We wanted to invite you upon listening to your presentation on gem history, or rather the history of gem cutting, during the Tucson Show 2018 (USA, Arizona, late January). You went through a lot of interesting points then and we were wondering if you’d be ok to go through this interview with us in order to share this knowledge of yours with the Loungers, our readers! 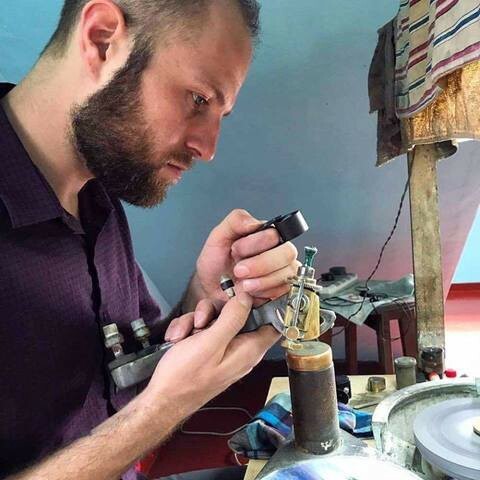 And so, as per usual, our first question is: Who are you Justin K Prim, tell us more about you and how you came to study the history of gem cutting?